How To Get The Highest Price For Your Home and Deal With Low Appraisals! The most difficult thing for a Seller these days is to get top price for their property AND have it appraise for that price by the Buyers appraiser. While I cannot promise success, I can promise you a better shot at obtaining your goal. I apologize for the length of this. It seems complicated but it’s not. It is actually pretty easy when you understand the concepts and the motivations of the different players involved. So... grab a cup of coffee and lets work through this. It will make you money by pricing your home correctly. One disclaimer - it is possible to get a higher price than your property is actually worth to a buyer who is cash (i.e. no mortgage) and doesn’t get an appraisal. (A mortgage will never be obtained without a lender ordered appraisal.) Or they get an appraisal and are still willing to pay more than the property is worth because their mother lives next door or some other unique reason. I’m not saying you cannot find this type of buyer but they are rare and you run the chance of being on the market for a long, long time looking for a buyer who is willing to pay more than the home is actually worth. The question is - Would you knowingly pay more for a home than it is worth? And yet, Sellers regularly expect Buyers to do just that. First, YOU, the Seller, need to KNOW what is the highest price you could possibly expect in todays market. It seems intuitive to seek an opinion of your Realtor. I am a Realtor and I certainly appreciate that opportunity but my opinion doesn’t matter if my price that I would recommend to my Seller Client will not appraise by the Buyers Appraiser. You see, properties are sold by PRICE but loans are based on VALUE – not price. Whoa, aren’t they the same? Nope. And to further complicate your life, a Realtor cannot render an opinion of VALUE – only PRICE. AND, an Appraiser cannot give you a PRICE, only VALUE. So… what’s the difference? To illustrate, imagine the following scenario – as ridiculous as it may seem but it will help you see the difference. Let’s say that you have a house similar to others, in a nice subdivision of $300,000 homes. This one is in the same condition as its neighbors with no deferred maintenance issues. An appraiser, who looks primarily at the square footage and location of the Subject Property would normally give it a VALUE of $300,000 but in this case, gives it a VALUE of $290,000 because…. Every room has been painted black and it has red carpet throughout. Clearly a BIG University of Georgia fan! However, the paint is in great shape and the carpet is nearly new! The appraiser knocked off $10,000 because it was not “cosmetically” comparable to the other homes in the neighborhood to give it the VALUE of $290,000. Now, your real estate agent is asked to render their opinion of what PRICE you could expect to sell this home for. Your agent is thinking, “Wow, I have to find that one person out of a hundred potential buyers that would love this home.” The agent knows that most potential buyers will open the front door, look in to that black hole and turn right around and leave without ever looking further. The agent evaluates and thinks, OK, we have to paint the entire house with, at least, two coats of paint and change the carpet. That is a cost of at least $15,000-$20,000 and the only person who may want to take that on is a person who wants a real deal on the house. I might be able to PRICE this house at $260,000 to $270,000 - $20,000-$30,000 less than the VALUE it appraised for. And, I wouldn’t be surprised to end up getting a PRICE of only $250,000. It’s going to be a hard sell! Unfortunately, it doesn’t work the other way around. If this same home, in this $300,000 subdivision had a spotless, beautiful presentation and was filled with all those little extra features that cost $50,000 the Seller is expecting to see a PRICE of $350,000 obtained. The appraiser MAY go as high as $310,000 as a VALUE. Even though the real estate agent knows the potential buyers of this home will love it and even present a higher offer that is accepted, the appraisal VALUE will rule and the maximum PRICE the Seller can expect to obtain is $310,000. Now, to further complicate things, the appraiser is hired by the lender, or a cash buyer, with the implied instructions, “Give me the LOWEST VALUE you can defend.” since neither the lender or the buyer want to overpay the purchase price for their own protection. The result is often a lower than desired appraisal. So…. How does the Seller max out the price of the home to make sure they don’t leave any money on the table? FIRST AND FOREMOST! Get a Pre-Listing Appraisal with the instructions to the appraiser to provide you with “the highest value you can defend!” You need to know the highest possible price you could get because now you know the maximum value a buyer will give it. Select your real estate agent carefully. Not all are created the same and (unfortunately) most think that their job is done when they put the listing in the MLS (Multiple Listing Service) and plant a sign out front. Unfortunately, the things that a GREAT agent does are invisible to the Seller – except at the closing table. Carefully price your home to obtain the highest price in the shortest time. That selected agent needs to be able to effectively market your home to the expected buyers. Real, concentrated marketing will result in the broadest exposure to the most potential buyers that will allow you to max out your sales price. Let’s take three different purchase contracts (A, B & C) each of which get an appraisal. Lets explore these scenarios. We are making an assumption that you, as Seller, have pre-armed yourself with a Pre-Listing Appraisal. Now WE KNOW the highest VALUE a buyer and/or the buyer’s lender will put on this property. We also know that it is extremely unlikely that a buyers or lenders appraiser will (unaided) will come in at the same level as our Pre-Listing Appraisal. Contract “A1” comes in we get a very good offer that you accept! Now comes the appraisal and we are going to get a “randomly selected” (todays “law”) appraiser. If it were a good appraiser, we would expect their VALUE to come in the grey area between arrows 1 & 10 on this property. 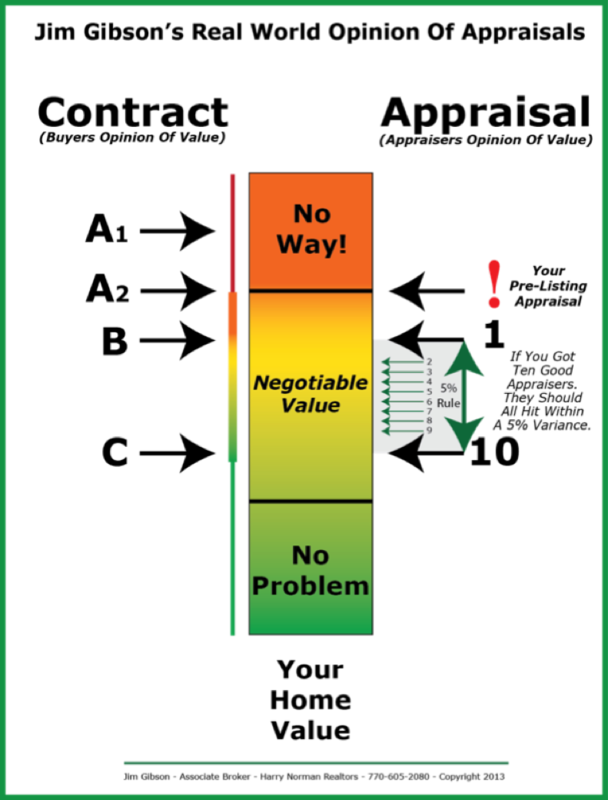 Because we did our homework, we pretty well knew where this probable value window is. Here is the interesting part. The appraiser came up with a VALUE that they felt comfortable with. The offer was MUCH higher than they could support so they stick with THEIR VALUE. Just too far apart! An example to help with the concept – you are playing baseball – a fly ball is heading your way – your brain calculates that there is a chance you can get to it so you try hard to catch it but if your brain tells you that it is way over your head and there is not a chance in the world you will catch it, you never move your feet and stay where you are. This explains why appraisers will sometimes come up to meet a Purchase Contract price when the appraiser thinks the VALUE is just a little lower than the Purchase Contract and sometimes not when the difference is large. Contract “B” comes in at the top of the 5% grey area and almost all good appraisers will easily agree – “willing buyer, willing seller and a contract price that is easily in the 5% grey area. Some appraisers will have to “push” a bit and others will not. This contract should appraise but the Seller left some money on the table. Contract “C” comes in and, being on the low side, easily appraises even by the worst appraiser. No Problem. So… our strategy is simple. Find out the HIGHEST POSSIBLE APPRAISAL VALUE, and to make it very attractive to potential buyers, price your home a tad less so we can market “Below Current Appraisal”, show our appraisal and stick to the price. If we get an offer at or slightly below our asking price AND we get a little lucky and get an appraiser that comes in closer to the high range of the 5% window, that appraiser may reach to our purchase price and you just maxed out the sale price of your home. Because the price was not “over their head” they will at least come up closer to our contract price. Pricing the home above the Pre-Listing Value is only a waste of time because any offer we get in that area would not appraise and the deal would fall through. Even worse, good Realtors will realize that the house is overpriced and will tell their buyers so and perhaps not even show it. Also, being overpriced, it may not even come up under the search criteria. Another risk of overpricing is that, as nice as your home is, it will not compare favorably to homes that are legitimately priced at high price level you have. So… even if the potential buyer looks at it, they will see that they get much more for the same price over in “that other subdivision”. The bottom line on overpricing is that your home is invisible to legitimate buyers and buyers that see it will be disappointed in it as compared to others in that price range. Your home will age and become “Stale” on the market. You will wind up taking LESS than you could have received had you priced the home correctly initially.